The TS-2888X packs everything required for machine learning to help organizations quickly and easily implement AI applications. QNAP’s QuAI computing platform reduces the time and complexity of implementation and management. The TS-2888X supports multiple graphics cards to empower data-intensive machine learning. The Intel® Xeon® W processors in the TS-2888X provide up to 18 cores/36 threads and up to 4.5 GHz with Intel® Turbo Boost Technology 2.0, combined with up to 512 GB DDR4 ECC RDIMM 2666 MHz memory to deliver rapid workload loading and processing. QNAP’s exclusive QuAI enables data scientists and developers to quickly build, train and optimize machine-learning models running on QNAP NAS. Backed by high-performance machine-learning algorithms, the ready-to-use AI environment enables a range of open-source tools and frameworks (including Caffe, TensorFlow, and more) for the AI workflows readily available to you. The combination of system and software helps reduce time and complexity for setup and maintenance of AI environments. Data must be preprocessed before it can be provided to machine-learning algorithms. Data preprocessing can consume a lot of memory, which has the potential to impact system performance. To maintain high performance while tackling data preprocessing you can install up to four U.2 SSDs in the TS-2888X. By configuring a RAID 0 for all four U.2 SSDs, you can obtain maximized bandwidth and higher capacity for preprocessing workloads, leading to improved quality, performance, and higher cost- efficiency. The Intel® OpenVINO™ (Open Visual Inference & Neural Network Optimization) toolkit helps to streamline and accelerate deep learning inference, bringing computer vision and deep learning capabilities to edge devices smoothly. With the heterogeneous support for inferencing pre-trained models on Intel® architecture hardware targets (CPU/GPU/FPGA/VPU), the OpenVINO™ toolkit allows you to optimize and verify the trained models developed by the TS-2888X before inferencing, and economically distribute vision solutions leveraging AI. Machine learning requires a large set of data feeds, and Download Station can help to organize downloading tasks for massive training data. For example, more than 9 million images are in the Open Images Dataset v4 (20 TB complete sets, and 600 GB for competition purpose in 2018), and you can create download tasks using Download Station to collect those images automatically and on a scheduled basis. Even with the best graphics cards at hand, the bottleneck for AI model training tends to be determined by IOPS as data sets grow and the training data comprises of many small data sets (usually more than 10 TB). The TS-2888X supports SSD caching to accelerate IOPS performance and reduce latency for storage volumes, providing many benefits for the metadata-intensive, small file I/O requirements of AI workloads. Qtier™ technology can also empower the TS-2888X with auto tiering to help strike a balance between performance and storage. Record the state of your system at any moment with snapshots. You can easily keep track of the state of your data, trained models and system at any time, and mitigate disastrous losses of trained data/models. In the event of malware attacks or unwanted changes, your stored data can be quickly reverted and restored to a specific point in time with snapshots to ensure continuity. Creating AI-scale data sets takes a long time, and losing them can be catastrophic. The TS-2888X supports Hybrid Backup Sync - QNAP's reliable and cost-effective backup & disaster recovery solution - to assist organizations in routine backup jobs. Hybrid Backup Sync consolidates backup, restoration and synchronization functions (using RTRR, rsync, FTP, CIFS/SMB), allowing you to easily synchronize data across various cloud storage, arrange scheduled backup tasks for onsite/off-site backups to ensure double protection, and to quickly restore data if needed. 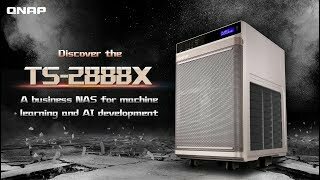 The TS-2888X integrates AI-focused hardware and software to reduce the time and complexity for implementing and managing AI tasks, making it the ideal AI solution with great cost-efficiency for most organizations and industries. Read more about Qnap TS-2888X-W2123-32G auto tiering. If you buy this Qnap NAS Server for AI and hard drives we do free build and test for the unit and hard drives. So you can use this device straight out of the box. All free of charge in TS-2888X-W2123-32G price.